Fig. 5.1. Old-Growth Canopy at Silver Creek Heritage Grove. Photo by Daniel Patton, April 17, 2018. . 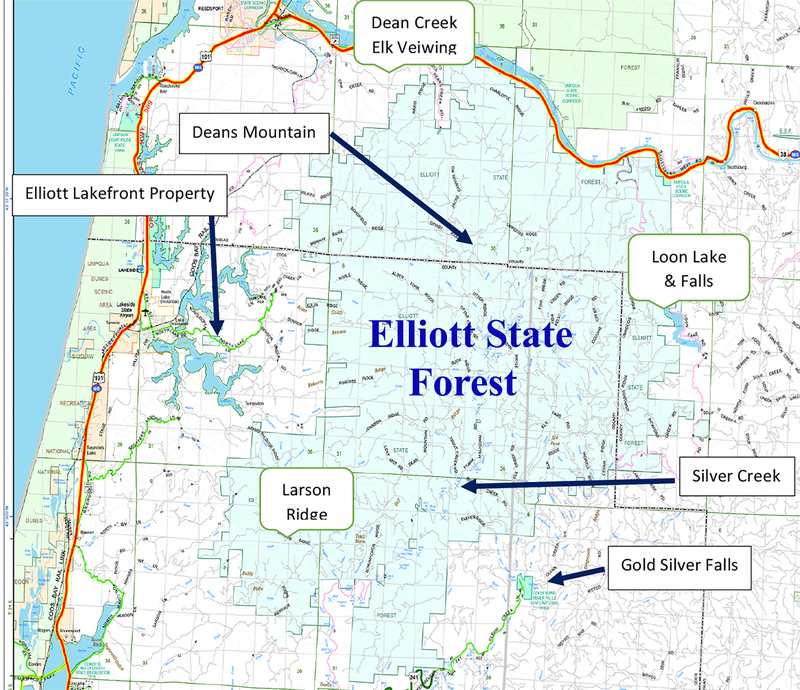 The Elliott State Forest has many features that any visitor, or a local resident can explore. With a short 30-minute drive from the city of Coos Bay, you can gain access to the Elliott. 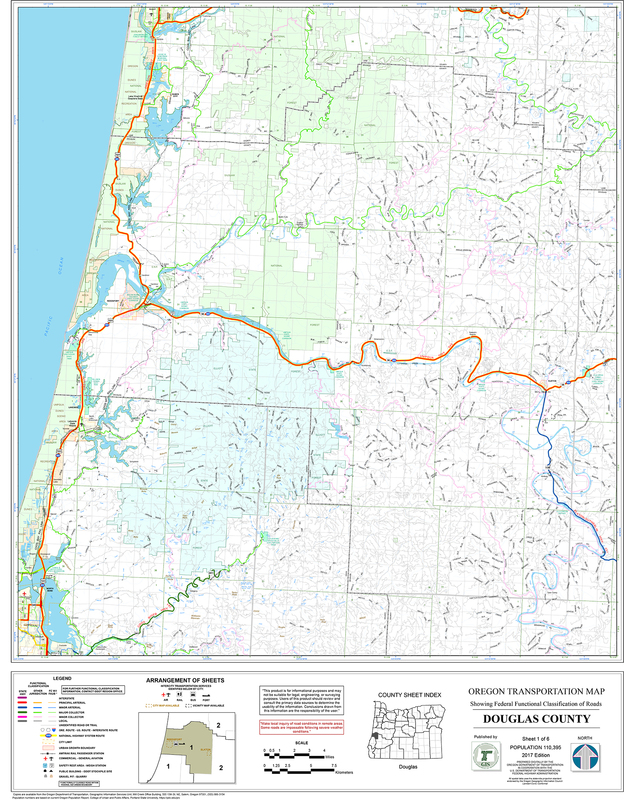 There are multiple entry points ranging from the West fork of the Millicoma River, up to the Umpqua River. The Elliott provides 93,000 acres of land for the public to enjoy. Sightseeing is a popular recreation activity and can become more with new visitors coming to explore the Elliott. Caution should be used while occupying the narrow roads. Reviewing the area by map would be advised, due to the lack of signage. BLM Dean Creek Viewing Area; Indian Trails; elk trails; early pack trails; CCC roads; Columbus Day Storm roads; Loon Lake; BLM commercial camping; Mill Creek splash dams; riparian vegetation control; Huckleberry Point; Indian Point; ethnobotany; wild flowers; Tenmile Lakes and Elliott tributaries; tideland channeling; Millicoma Hatchery; Elliott lakefront property; exotic fish management; native fisheries (including eels); Golden and Silver Falls; Millicoma River; Deans Mountain; Silver Creek Old-Growth viewing. Map 5.1. Map of Scenic Photograph Locations (Oregon Department of Transportation 2017 base). To seek out scenic vistas, a drive to the highest ridgeline would be best. 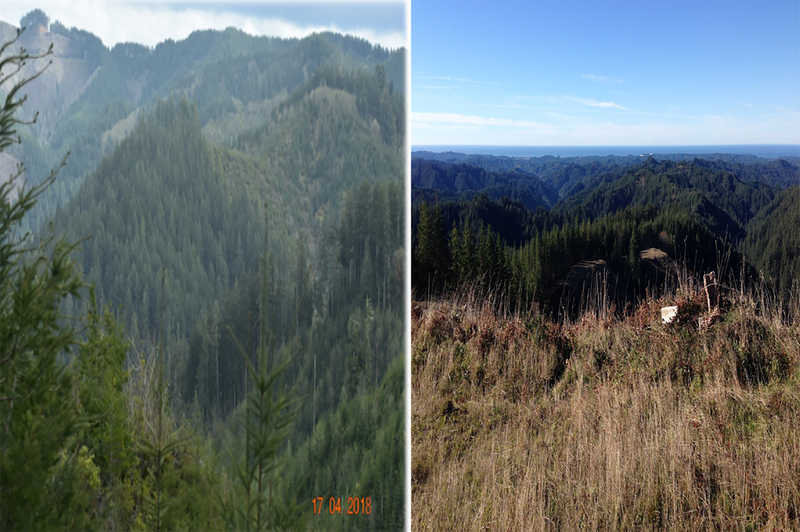 A logging clear-cut can provide an open space that provides miles of viewing from all around. In certain locations, east of Tenmile Lakes, the Oregon Dunes and beaches can be seen. On a clear sunny day, the quality of sightseeing can increase dramatically. This provides photographers an excellent chance to get long-distance shots. A list of places providing scenic vistas include, Indian Trails, elk trails, early pack trails, Columbus Day Storm roads, and Deans Mountain. Fig. 5.2. Elliott Scenic Vistas. (Left) Photo taken from Larson Ridge facing south, by Daniel Patton, April 17, 2018. (Right) Photo taken from Deans Mountain facing west, by Bob Zybach, December 6, 2017. The Elliott contains hundreds of creeks, several rivers and a couple of lakes all available for viewing. Two main waterfalls I would recommend visiting are Gold and Silver Falls. They are located an hour's drive east of Coos Bay. A large lake located Northeast of Coos Bay is called Loon Lake. Travel time from Coos Bay to Loon Lake is approximately one and a half hours. A day fee and a moderate hike can get you to another waterfall, through the Loon Lake campground, that is great for exploring and viewing. Fig. 5.3. Elliott Area Waterfalls. (Left) Loon Lake Waterfall, June 3, 2018. (Right) Silver Falls, May 22, 2018. Both photographs by Daniel Patton. There are approximately 209 species of animals located with in and around the Elliott. This includes: 58 mammals, 103 birds, 23 amphibians and reptiles, and 25 fish species. A list of Elliott wild mammals follows; a listing of Elliott birds is included in Chapter 9. Fig. 5.4. Elliott Wild Animals. (Left) Elk from Dean Creek Viewing Area, May 15, 2018. 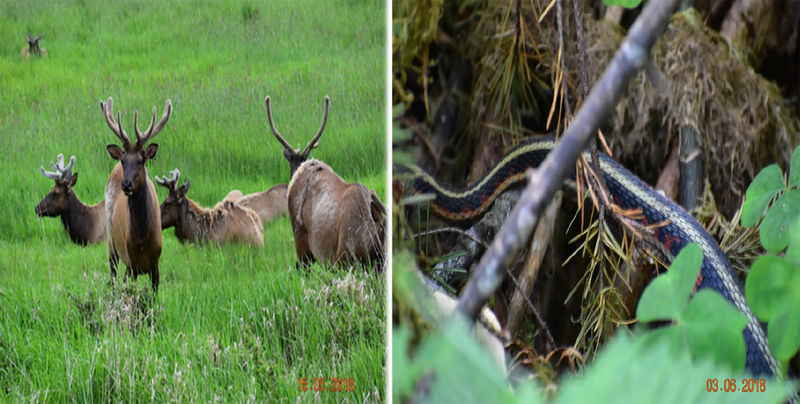 (Right) Snake near Loon Lake, June 3, 2018. Both photographs by Daniel Patton. Table 5.1. Wild Mammals of the Elliott (Decker et al. 2011: E-5-6). Table 5.2. Commercial Elliott Sightseeing Opportunities. Barriers that could put a halt on this topic would include roads and trails. If the roads are not maintained, then access to the different locations for viewing might not be possible within a day. Hiking to these locations could be possible. Starting in the morning would give more time for travel and exploring. Also, trails need to be cleared and maintained to allow for better access. Having a map constructed of roads and trails. Then adding user friendly directions and locations of the different features and landmarks on the Elliott. Installing signage for trail routes. Having the option of speaking to a park ranger or someone familiar with the forest to give more insight about the different features available. “Still another factor was that this forest is at once both aesthetically pleasing to most all visitors and economically very productive,” Jerry Phillips (1998: 413).